When, you are trying to upgrade or downgrade or restore your iPhone, iPad or iPod’s iOS at that time you may get iTunes errors 1600, 1601, 1602, 1603, 1604 and 1604xx. 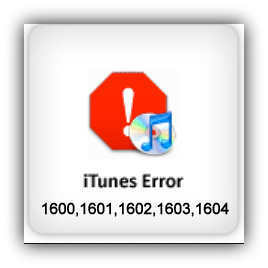 Don’t frustrate dear user here you can get fixed solution of how to fix iTunes errors 1600, 1601, 1602, 1603, 1604 and more. Almost these kinds of issues happen due to either your Mac\PC has old iTunes version or it’s not connect properly with server. Here are we giving you two ways as a basic solution and another one is as an advance troubleshooting. Second way: to fix iTunes Errors 1600, 1601, 1602, 1603, 1604 and 1604xx. This way you can also apply to solve the errors code 2000, 2001, 2002, 2005, 2006, 4013, 4014 and more. These all kinds of errors are occurring due to USB Cable problem between your iOS devices and your Computer. Either use that USB cable which has came with your iOS device or use other Apple USB cable. Keep your USB cable connect directly into the computer’s port instead of connect it with keyboard or other device. If an issue is not move then you can check further solutions regarding to USB cable as well as if Software problem then follow this Security Software source.